Based in the Netherlands, U-Boat Worx is a company who specialise in producing small, easily operated submersibles for both private and commercial use. Their C-Quester model is designed primarily for pleasure use and underwater sight seeing, but this, the C-Explorer is intended more as an undersea work horse. The U-Boat Worx C-Explorer features a completely new design when compared to the original C-Quester model. But underneath they share similar technology and proven systems. New in the C-Explorer product line is a catamaran-style design that is combined with a fully acrylic pressure hull to result in optimal underwater viewing. The patented floaters are flexible bags encased in a housing that automatically folds in when submerging, thereby creating minimal drag and easy storage in a standard container or on board a ship. The U-Boat Works C-Explorer will be available in four different models and sizes. 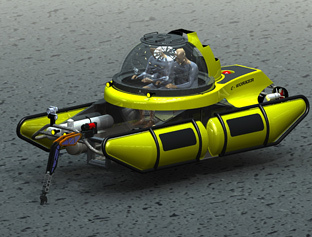 C-Explorer 1 - is a compact, light-weight, one man submersible. C-Explorer 2 - is a 2 man submersible which merges the reliability and experience of the C-Quester submersible with an economic, modular, and versatile work-platform for research, exploration, scientific and offshore applications. 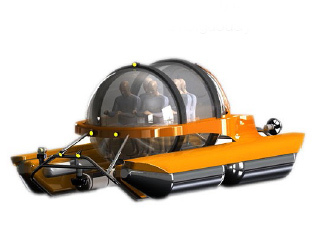 C-Explorer 3 - is a three person sub which is versatile enough to help with offshore research, exploration and scientific work. C-Explorer 5 - the C-Explorer 5 is the largest in the range and seats 5 persons. This model offers superior space, visibility and autonomy. It's suitable for for mega yachts, and to explore the depths of the ocean, and also for tourist operators who want to offer their clientele a unique undersea experience. All versions of the C-Explorer feature a one-atmosphere design. This means there is no pressurized atmosphere inside the cockpit and the occupants do not have to regulate their dive or ascent rate to allow for decompression.